I know that saying usually applies to summer. But, here in Arizona the heavy heat has made fall feel more like the middle of July. Hopefully the cool weather will return and give us all some relief. Even though it has been hot, my girlfriend and I got out into the yard last week and decorated for Halloween. The decorations aren’t nearly as cool as my Christmas display, but I am adding on every year. One of my favorite things about being a homeowner is celebrating the holidays. My family always went all out and I am having a lot of fun collecting stuff for my own yard now. The games this week were tough, but I am happy with how my outings have gone so far. My girlfriend brought a few of her co-workers to a few of the games to check out the AFL for the first time. She works at one of our favorite “mom-and-pop” restaurants down the street from our house. The regulars are some of my biggest supporters and it is always great to have people like that come out to games and be a part of the action. 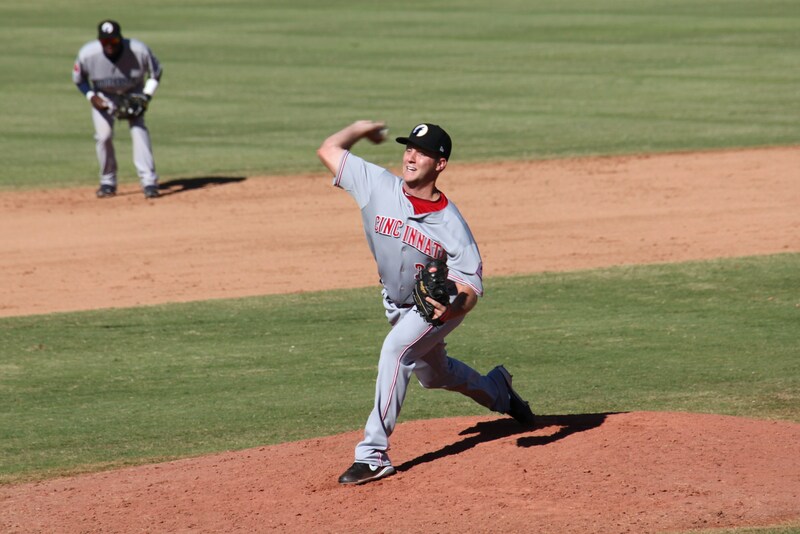 On Friday I threw 2 1/3 innings which was a great challenge for me. That was the most I had thrown in a game in quite some time, and it felt good to be stretched out since I hadn’t thrown in a few days. I made it through with only a little bump in the road, something all pitchers dread…a balk. Many people don’t know exactly what a balk is, but basically it involves any actions on the part of the pitcher, while a runner is on base, that could deceive the runner. A lot of times, balks are pretty unclear and are usually based on the opinion of the umpire. But either way, I was charged with one but ended up striking the batter out so all ended well. I am looking forward to our night game tonight, and hopefully checking out the AZ State fair some time next week. I think next week is going to bring some great things for the Dogs, and I am ready to get back out there and get some wins. Brad, nice outing yesterday. did you know in advance that you were getting more than the 9th? Who is your QB and what QB are you facing this weekend? I’m always looking for “mom and pop” joints. I will inquire when I arrive. I’m glad to hear you are enjoying the blog. It is fun to show everyone a side of my life outside of baseball. Unfortunately, I am not currently on Twittier.